On a busy corner in industrial Alexandria sandwiched between old warehouses, a mechanics workshop and a busy intersection, sits Grandma’s Little Bakery, decorated with whitewashed wrought iron tables and chairs, manicured hedges and pink plants in ornate pots. Pink potted plants and ornate outdoor furniture - Grandma's Little Bakery is definitely the cutest warehouse in Alexandria. Inside, the cutsie-pie lace doilies and tea cozy décor alluded to outside gives way to what would be best described as cafeteria chic. Tables surrounded by red and black chairs fill the sprawling dining space while fluorescent lighting, soaring ceilings and exposed steel beams hint at the space’s industrial past. However homely touches, like a blackboard with inspirational quotes, a photo collage and a pantry nook, filled with homemade dips, sauces, oils and cookies as well as cute knickknacks for the home add warmth and character to this warehouse conversion. 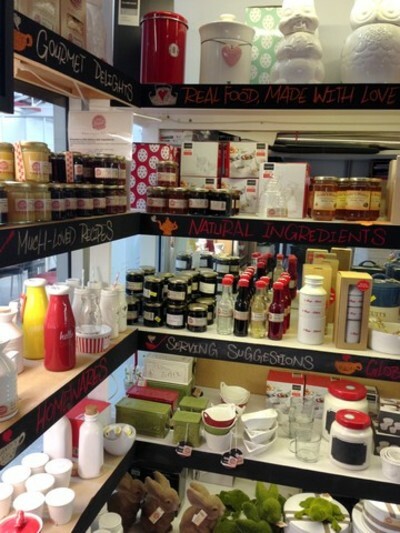 A pantry nook filled with jams, sauces, chutneys, cookies and homemade oils all available to purchase. On weekend mornings, Grandma’s Little Bakery puts on a breakfast buffet complete with a toast and muesli station as well as an assortment of sweet pastries, desserts, cakes and fruits. Every other day there is a large menu available that includes chef’s specials and rotating menu items based on seasonal availability. 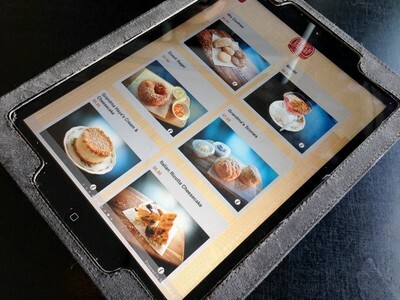 The very hi-tech menu - can grandma even use an iPad? Sitting down, one of the wait-staff deposit an iPad - the menu on your table. While the interactive menu seems infinitely cool in theory, in practice, it’s actually rather more an annoyance as there is only one menu per table, regardless of the number of diners, and there is often a bit of a wait just to receive your menu. Grandma's most popular dish; the classic shakshuka. Serving all-day breakfast and lunch, the food at Grandma’s is homely and rustic; just as the name suggests, with a distinctly Middle Eastern vibe. 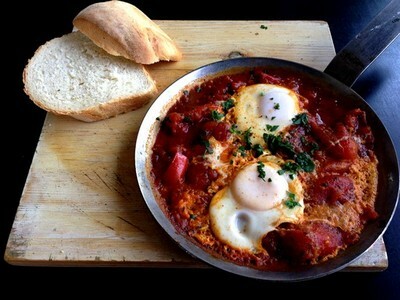 One of the cafés most popular dishes is Grandma’s classic shakshuka ($14.50). Shakshuka is a Middle Eastern and North African breakfast staple, with two eggs poached to oozy perfection in a sweet tomato and onion based sauce that is spiced with the earthy flavours of cumin and served with slabs of fluffy fresh bread; perfect for soaking up the rich sauce. In winter, Grandma's focuses on warm and hearty meals that use the best of fresh seasonal produce. For lunch, there is an assortment of fresh pastries, pies and salads, with a focus on comforting casseroles and soups this time of year. 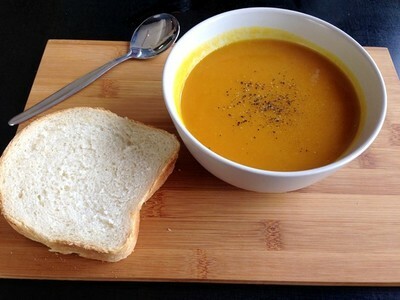 While the pumpkin and sweet potato soup ($7.50) is rich and hearty, served with grandma’s signature fluffy white bread and butter, the soup falls flat in the flavour department. The beef and mushroom vol-au-vents ($11.50) however do not. Encasing tender beef and mushrooms in flaky, golden pastry with a warm tahini sauce, the vol-au-vents perfectly combine classic French cuisine with vibrant Middle Eastern flavours. 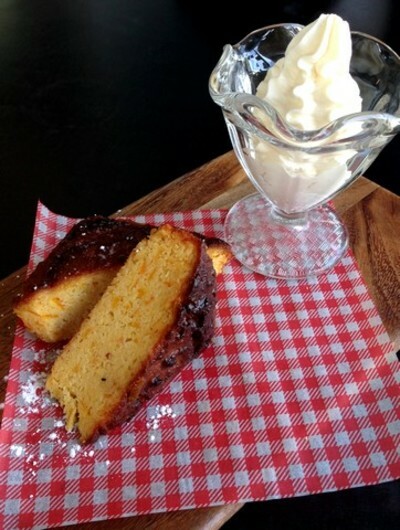 Moist and delicious; the gluten free orange cake. No meal is complete without dessert and at Grandma’s the desserts do not disappoint. While scones, cookies and cheesecakes are all available, two desserts that really stand out are the orange cake and malabi. The gluten free orange cake ($6.90) made with almond meal and whole oranges is moist and delicious, delivering a refreshing citrus hit with each and every bite, and the malabi ($4.90) is basically amazing in a cup. Malabi is a luscious and creamy milk pudding, subtly spiked with the floral notes of rose and topped with crunchy pistachios, coconut and a pretty pink hued sugar syrup. 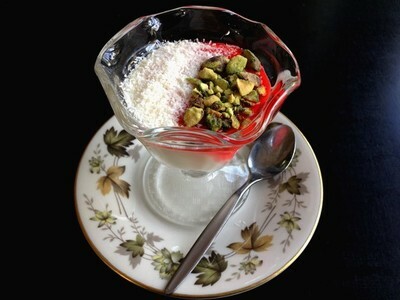 Rosewater and pistachio malabi - amazing in a cup. While certain menu items fall a little flat, when Grandma’s stays true to the vibrant flavours of North Africa, the Middle East and the Mediterranean, their hearty homemade meals and lively fusion dishes deliver warm, comforting food in a relaxed, casual setting that just might have you thinking your back at Grandma’s house. Why: Warm, comforting food that is full of vibrant and exotic flavours. When: Open everyday 7am - 4pm. 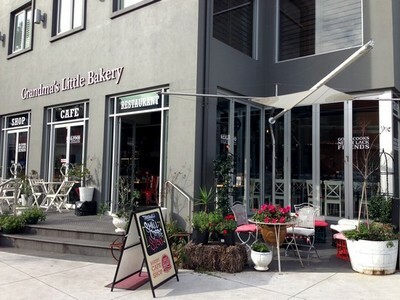 Take away: Yes, salads, pastries, sweets and coffee are all available to take away. There are also ready made meals, cookies and jams available for purchase.